This is my kind of show car. The two-seat land yacht measures 232 inches from bow to stern, exceeding the stately Maybach 57 on which it is based by the length of a Davidoff stogie–if that’s not overkill, I don’t know what is. Equally outlandish is the engine, a frighteningly free-breathing, twin-turbocharged, 5.9-liter V-12 that coughs up max power of 691 hp and 752 lb-ft of very low-end torque. And then there’s the styling. Vulgar, over-the-top, and utterly beguiling, it’s perfect transport for Darth Vader. It looks as if it eats parked cars for breakfast, parties with dinosaurs, and went to school with the Frankenstein monster’s son. In the unlikely case that the stance and the proportions leave you cold, the sound effects will grab you by the eardrums. The two pornographic side pipes emit a thunderous, earth-shattering noise. Oh, and by the way, it does 218 mph. When I arrive at the test track to drive it, the monster coupe’s makers are lined up behind it: Jrgen Weissinger, chief engineer and project manager; Harald Leschke, design coordinator; Joachim Lang, program test engineer; Rolf-Dieter Stohrer, senior product manager for Fulda tires; and Helge Jost, marketing manager for Fulda tires. Fulda? The little-known Goodyear/Dunlop affiliate triggered and funded the Exelero to promote a new range of high-speed, ultra-wide, low-section gumballs. I’m the first journalist to drive their precious baby–and to lay some Exelero rubber. By show-car standards, getting into the malevolent-looking monster is a piece of cake. The long door opens wide, and the cushy leather seat moves back far enough to accommodate the longest limbs. Despite the Fulda-red stripes and the shiny carbon-fiber door panels, the instrument panel is essentially pure Maybach. The piano-black center stack, for instance, incorporates Comand along with the familiar HVAC controls, and the power adjustable steering wheel is a four-spoke device with a hub cushion so big it could house enough air bags for the entire Addams family. Leschke sticks his head through the side window and helps me tighten the fire-red, five-point racing harness. “When designing the cockpit,” he says between puffs of a Marlboro, “we combined elements from the Maybach 57 sedan with racy new touches like the transmission gate, bespoke neoprene and carbon-fiber trim, aluminum accents, and draft-free air-conditioning.” What air-conditioning? To make sure that all 691 horses are on board, the A/C system has been deactivated. But that’s a small price to pay for an overdose of power and torque that ensures I’m still on a high when I head home from Stuttgart that evening. The tip of my tongue is numbed by the acid aftertaste of the 110-octane racing fuel. My nostrils are still clogged with pun-gent traces of Eau de Exelero. My field of vision has been badly blurred by the force of twelve cylinders gone wild. My palms are shaky from too much (or too little) opposite lock. And my ears are a bit numb from Maybach death-metal music. 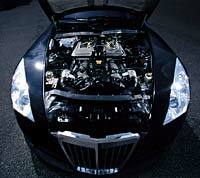 Unlike most styling exercises, the Exelero is definitely a runner. On May 1, it proved its point on the Nardo high-speed oval in Italy, where racing driver Klaus Ludwig whipped it to a top speed of 351.45 kph (218 mph). I ran out of road at an indicated 125 mph, but a 0-to-62-mph run was pretty exciting, as the Maybach fisted past the wilting roadside daisies to clock 4.4 seconds. That’s GT3 territory, not bad for a converted luxury liner that weighs three tons counting fuel and Kacher. The dry weight is an almost equally obese 5852 pounds. Redlined at 6000 rpm, the 36-valve V-12 produces peak power at just 5000 rpm. 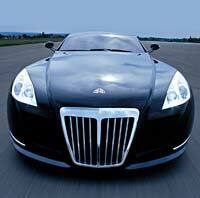 Compared with the standard Maybach 57/62 engine that’s rated at a mere 543 hp, the Exelero has more displacement (up from 5.5 to 5.9 liters), bigger turbochargers, a manlier radiator, and a larger intercooler. It’s soon time for serious leadfoot action. During the morning warm-up, an overenthusiastic crew member warped a pair of front brake discs, so I’m told to take it easy with the second and final set of rotors. No one says anything about saving the tires, so I turn the traction control off, at which point the wide-body coupe duly sheds any semblance of manners. On hot, dry pavement, you have wheel spin in first, second, and third gears. Since peak twist action enters the party early at 2500 rpm, a mild stab at the throttle is enough to kick out the tail and cause paroxysms in the stability system. But maintaining that sideways action is trickier than expected, because the transmission feels compelled to change down when you massage the throttle a little too hard, and it changes up the moment your hoof loosens its grip. This is fine when you are out to play in a C55 or an E55, but the adrenaline triples when the star of the slide show is a prototype worth 5 million euros. And I’m not telling how many times this one got away from me. While the platform, the suspension, and the fuel tank were taken largely from the sedan, a second firewall had to be added, and the seats, the steering column, and the pedal box were moved back by 15.7 inches. As a result, the Exelero looks and feels like a proper coupe, not like a two-door notchback. Interestingly enough, the proportions and dimensions of the 2005 version are quite close to those of the prewar original. On the long back straight of the track, the Exelero’s aerodynamic qualities are patently obvious. Despite the in-your-face frontal area, front-end lift is well contained. Three manually activated tail spoilers keep the rear planted. The drag coefficient of the model made from the winning proposal of Fredrik Burchhardt was 0.35 when it first checked into the wind tunnel, but that was trimmed to 0.28 by selectively blocking off the air intakes, lowering the ride height, fitting a flush underbody, covering the rear wheel arches, and mounting dished wheel rims. Although the Exelero definitely won’t go into production, it feels as solid as if it were milled from a single piece of metal, like those SLR-style turbine wheels. Even though the engineers were able to use numerous carryover components, the exterior and the interior were built from scratch by Stola, Turin-based prototype specialists. Neat features include the four pillars for the roof, the sleek greenhouse, the ground-effect rear venturi, and the complex bodywork around the wheel arches. Although it takes a fish-eye lens to capture the 23-inch wheels in their full beauty, the massive rear tires look almost lost from certain angles in their voluptuous all-black surroundings. At mid-afternoon, I feel like a king, and I’m beaming from ear to ear, reluctant to relinquish my new toy. But all good things must come to an end, and they do at the service area. The Fulda mechanic finds that the tire temperatures are close to the flamb point and the pressures have gone sky high, while a Mercedes-Benz engineer tells me that the day’s supply of 110-octane fuel is pretty much depleted. Although the consumption is not as exorbitant as at Nardo, where the Exelero averaged 2.4 mpg, there is no doubt that the V-12 combusted enough juice to punch a few more holes in the ozone layer above Stuttgart. Although this show car is about as politically correct as the Cadillac Sixteen or the Chrysler ME Four-Twelve, it does its job. It puts the Fulda name on a map that used to be dominated by Michelin, Pirelli, and Bridgestone. And it also moves the Maybach image away from that of a conservative S-class clone, pushing it more toward a bespoke coachbuilt driving machine. I have already reserved a place for the mighty mauler in my dream garage, right next to the Heinz Phantom Corsair and the original Batmobile from Gotham City.